For many of us it is difficult to believe the above statement considering the perception of email marketing and the copious amount of emails we ignore each day. But research has revealed that this digital dinosaur is actually more effective at driving conversions, which are certainly key to any eCommerce business. Monetate’s Ecommerce Quarterly report for the opening period of 2013 has highlighted the importance of email as a driver of conversions in their survey of more than 500 million online shopping transactions. 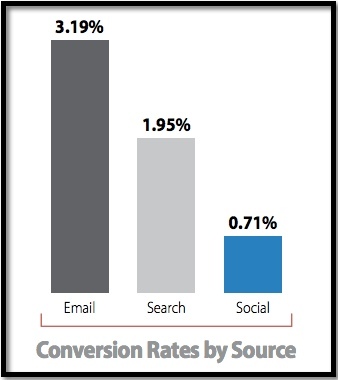 As the image below shows, the conversion rate for email was higher than both search and social at 3.19%. Email also matched search in terms of customer referrals, as the average number of page views for each visit emanating from these mediums was 9.02. Yet search was the clear winner in terms of overall traffic, accounting for 31.43% of all visits compared to the 2.82% driven via email. However conversions have an obvious impact on profitability and the question is how search can become more drive more converting users?